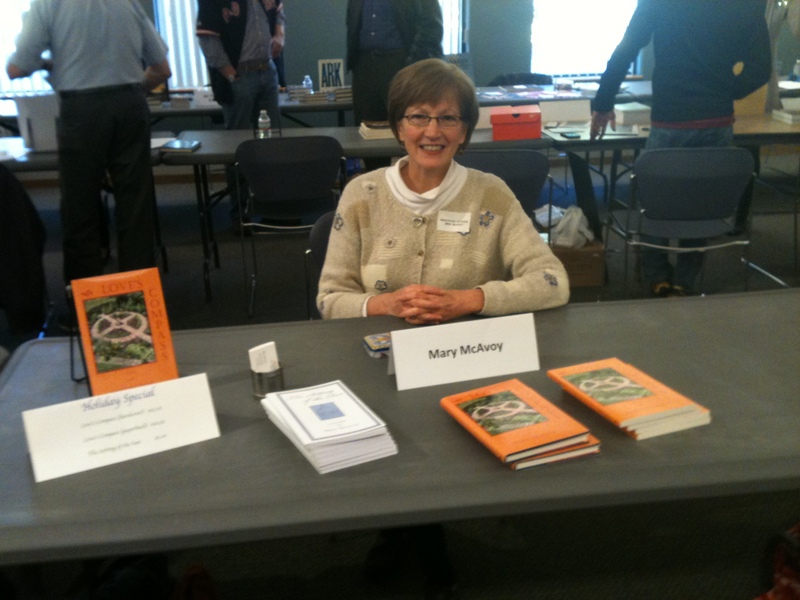 Well, there I am at the annual, local-author book signing and sale at the J.V. Fletcher Library in Westford, Mass.! In reality, I sat very little in that spot and spent much more time walking around the room visiting the stations of the other authors. This year I found that I didn’t have enough time to talk with all the writers I wanted to. There were so may interesting folks there with great ideas for books. Writing creates a pretty solitary work week, so to be out among authors was a real treat. Judy Buswick has two gorgeous books – one about slate (yes, as in the stone!) and one about quilting. I had a wonderful conversation with Christi Guthrie of REACH! She is one of three women who have joined their highly energetic forces to help us realize how to achieve our personal and professional goals. These women also run a business my little Black Box — check it out and be sure to read all about them on their “3 Crazy Chicks” page! Their book, REACH! dream | stretch | achieve | influence will be released November 15. I met Kyle Giroux last year – a young author who I enjoyed seeing again. His first book, Death in the City, looks great and he’s well into the writing of a second. Sitting beside me at the book sale was Bety Cumerford who has written on a fascinating topic, Ghost and Shamanic Tales of True Hauntings. I thoroughly enjoyed hearing her tell me about her experiences with those who reside in the realm that lives alongside us – a between world where they are neither fully among the living nor fully with the dead (my rudimentary explanation!). What comic-book-reading youngster wouldn’t love to tumble into the world on the pages in his hands! That’s just what Ansha Kotyk has written about in Gangsterland! David Daniel‘s collection of books, a dozen or so, scattered about his table at today’s event really humbled me! But he’s been writing a long time! David and I trade books and I’m more than half way through his collection of short stories, Six Off 66, and I have enjoyed each story I’ve read so far. David has a sparse style – he doesn’t seem to need many words to present a rich story. I had a quick chat with David Brody with whom I shared the podium at The Westford Museum and Historical Society one evening when we each talked about our writing. And I’m sorry I didn’t have a chance to talk with Laurie Miller who I know through Art on Main in Westford. Laurie has a book, Paint the Town! An Artist’s Perspective on Westford, Massachusetts, published in 2011. I love her paintings and she’s generous with her time instructing those interested in pursuing painting. It was a wonderful afternoon. Oh, yes, and I sold some books as well! Thank you to the J.V. Fletcher Library and the Westford Museum and Historical Society for sponsoring this event. And thanks to all who participated, both the authors and the folks who stopped in to see our work!